In this article I would like to provide you with information about my itinerary through South America within 154 days I spent travelling and some practical tips on where to go and what to do on this amazing continent. If you are interested in financial tips for South America, then have a look at my BUDGET article. I have also travelled through the whole CENTRAL AMERICA and you can also read my article about my 3 month itinerary for Central America and also about my budget for Central America. So first of all let me tell you about my time frame for travelling. I spent total of 8 months and 6 days in South America. Out of this period of time I spent more than 3 months working as English teacher at the University of Sinu in Monteria, Colombia. The rest I spent backpacking or volunteering in Banos de Agua Santa, Ecuador. 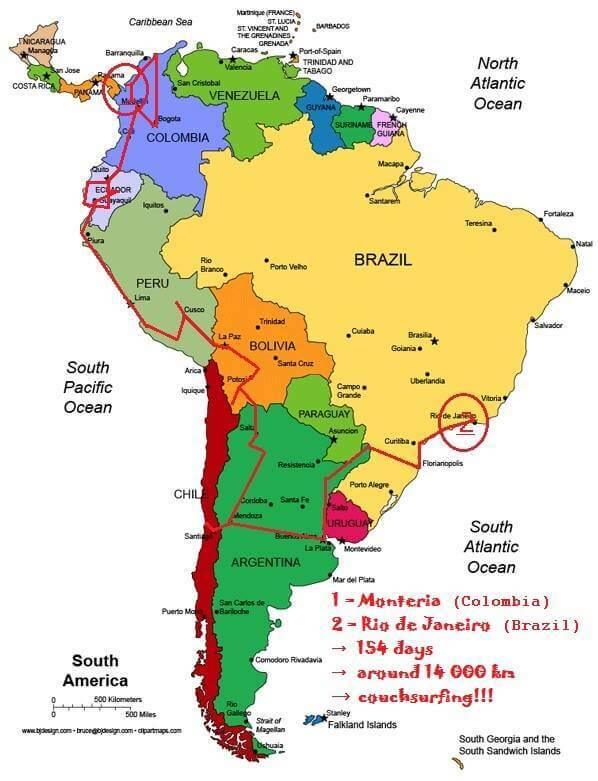 All together 154 days, 7 countries & around 14 000 km on buses. Sounds a lot?! Well, when I started travelling I had no return ticket back to Europe. However, after I finish my Ruta del Sol in Ecuador I decided to buy one for Christmas. So from then on I knew that my time in each country would be limited to certain period. But I still tried to stay at one place as much time as I wanted and skip the others which didn´t call my attention. How did I plan my itinerary?! At the beginning only thing I knew was the place from where I was about to start – from Monteria, Colombia! Only within some time I set my goal to finish everything where I originally started – in Rio de Janeiro, Brazil! Previous PostComing Back from Travels – Easy or Difficult? Paradny sumar, Mili! Urcite inspiruje mnoho ludi. Now you must do the same with North America or Eastern Asia! Remember that the US and China are so large they are really many countries in one.